Agilent Technologies introduces the next-generation Truevolt Series digital multimeters, an entry level range to the 6½ digit class of meters. Delivering several advantages over previous models, the Truevolt Series helps engineers see their measurement data in new ways, get actionable information faster, and document their results more easily. Exclusive Truevolt technology reduces extraneous factors such as noise, injected current and input bias current for increased measurement confidence. The Agilent 34461A DMM is a direct replacement for the industry-standard Agilent 34401A DMM, and is designed to enable simple migration for current 34401A users. 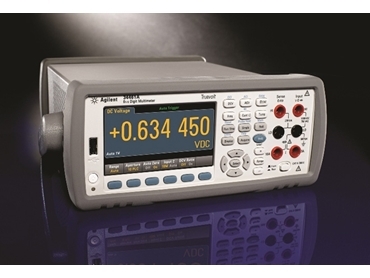 The Agilent 34460A offers engineers a basic entry point to the 6½ digit class of DMMs. Compared with the 34401A DMM, the new 34461A offers expanded current ranges from 100 µA to 10 A. Both the 34460A and 34461A have a temperature measurement function (RTD/PT100, thermistor) and expanded diode measurement capability to allow engineers to measure a larger full-scale voltage (5 V) so they can test more diode types, such as LEDs. Where most DMMs show results on a low-resolution numeric display, the Agilent Truevolt Series offers a 4.3-inch high-resolution colour display to view numerical readings, long-term trends (34461A only), measurement histograms and statistical information. Display preferences can be set and recalled automatically. The Agilent Truevolt Series 6½ digit digital multimeters offer advantages such as simple USB connectivity between the DMM and a PC using the standard USB media transfer protocol that allows easy file access and file transfer. Engineers can drag and drop measurement data, instrument settings and screen images into PC applications without any additional software. The Digital Multimeter Connectivity Utility software lets engineers control, capture and view the Agilent DMMs on their benches. With a single click they can transfer data to a PC via USB, GPIB, LAN or RS-232 (when used with older-generation Agilent DMMs). Using patented analogue-to-digital converter technology, Agilent Truevolt Series DMMs account for measurement errors created by extraneous factors, so engineers can be confident in their measurements. Agilent Truevolt DMMs have less than 30% of the amount of injected current attributed to the meter compared with DMMs made by other vendors. Truevolt DMMs also take care of input bias currents, which can create measurement errors in real measurement situations by adding voltages to DMM results. Agilent DMMs from the 6½ digit class of meters use digital direct sampling techniques to make AC rms measurements, resulting in true rms calculation and avoiding the slow response of analogue rms converters by other makes.